[NetBehaviour] book WRITING UNDER available! and night, he must have found some elixir). I underwrite this of course. 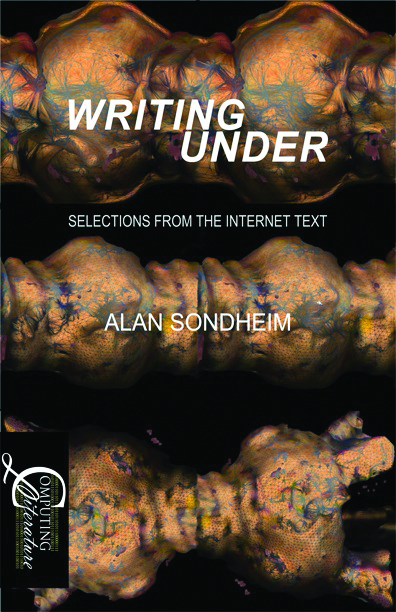 Alan Sondheim pens WRITING UNDER: SELECTIONS FROM THE "INTERNET TEXT"
writing online is entitled "The Internet Text." the world and its 'genesis redux' in their grip." Christopher T.
the real world has in the virtual. and its 'genesis redux' in their grip." leaving multiple re-reads a definite must." Internet since its very beginnings needs to read this book."